Backplates and wings are becoming more popular each year. These buoyancy configurations are no longer reserved for those technical divers, but moving into mainstream diving. On our main BCD page, we discussed the three main types of BCDs in use today. Here we are focusing on backplates and wings. •	Comfort. Underwater and on the surface this style provides more comfort because the holding straps stay secure. The wing does not expand around the diver’s torso. •	Cheaper. The basic plate and wing setup is usually cheaper than a comparable quality jacket style BC. •	More attachment points for extra gear or transit tanks. With pre-positioned holes drilled into the plate, it is very easy to attach clips to these holes. •	Streamlined underwater. Because the bladder provides lift directly behind the diver, there is less pushing the diver into the vertical position. With the diver in a more horizontal position, there is less likely a chance to kick up the bottom with the diver’s fins. •	Holds you scuba tank squarely on your back. Because the tank is bolted directly on to the back plate, there is less movement during the dive. 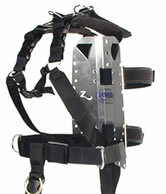 The straps are designed to hold he tank and plate to the divers back. Not everyone prefers the back inflation design of this setup. Mainly instructors and boat divers, who spend large amounts on time on the surface, feel this style can easily push the diver face forward when the wing is over inflated. The key is “over inflated”, if a diver stops inflating their BCD once their head is out of the water, the pushing forward tendency stops. If the BCD stays over inflated, then there will be a pushing forward effect. The plate: holds the tank and can provide some negative buoyancy. Shoulder straps are just that, should straps. They can come with quick release buckles and with optional pads for comfort. 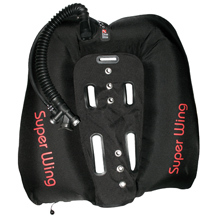 Wings come in different size for the buoyancy or lift the diver might desire.